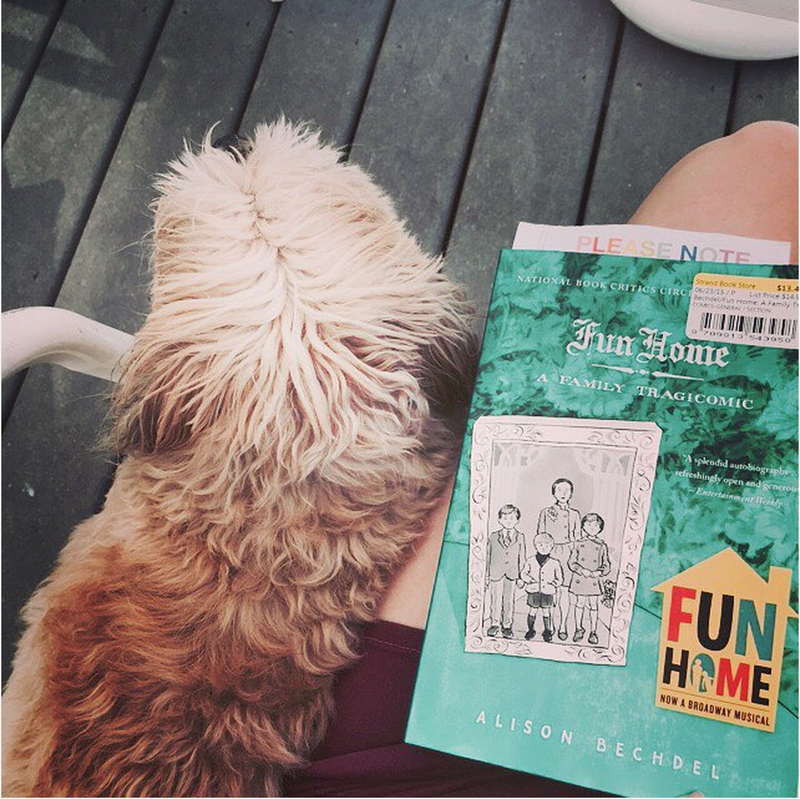 Last summer, I read and thoroughly enjoyed the graphic novel + memoir Fun Home by Alison Bechdel. The novel depicts the author’s relationship with her father and how she came to understand her sexuality and identity. While I really liked the book, I lamented that the author barely detailed her relationship with her mother. I was thrilled to learn that Bechdel had written and illustrated another book, Are You My Mother?, as a somewhat-sequel to Fun Home. It’s a “somewhat-sequel” in that it’s definitely a companion to Fun Home and alludes to the other book, but doesn’t continue the story chronologically. I absolutely LOVED Are You My Mother? and found it to be superior to Fun Home. That said, I do think you need to read Fun Home first in order to get the most out of Are You My Mother? This graphic novel grapples with Bechdel’s distant, yet extremely close relationship with her mother (who recently passed in 2013) — her mother kept her at a distance as a child, but called her extremely frequently as an adult, discussing trivial things instead of delving into the intimate details of their relationship, as is common for a lot of people with somewhat strained parental relationships. The distance and childhood detachment was likely a product of the societal and psychological norms of childrearing which existed in the 1960s/1970s, something that Bechdel spends a lot of time exploring within the novel. As someone who has spent a lot of time pondering my own relationship with my mother since she died when I was a child, I ultimately spent a lot of the time considering the psychological theories (drawn mostly from psychoanalyst Donald Winnicott‘s beliefs) that Bechdel shared in relation to my own experiences with my mother. I found the book extremely enlightening and I enjoyed the reflective mood that it launched me into. If you’re someone who doesn’t want to spend time analyzing your own maternal relationship, I don’t recommend this book to you, but if that idea piques your interest in any way, you won’t regret delving into the graphic novel. Because of my #FindABook project, I’ve gotten into the habit of giving away all of the books that I physically own after I finish them in order to eliminate clutter in my apartment. Since living in New York for the last 1.5 years, I’ve only wanted to hang on to two books and Are You My Mother? is one of the books that will stay in my lifelong collection and that is the strongest endorsement that I can give to a book. Publication Date: 1 May 2012 by Houghton Mifflin Company. Format: Paperback. This entry was posted in graphic novel, memoir, nonfiction, Review, sexuality and tagged alison bechdel, are you my mother?, book blogger, book review, child, childhood, childrearing, fun home, graphic novel, houghton mifflin company, maternal relationship, mother, motherhood on January 19, 2016 by Bri with a book blog. As someone who hasn’t read many graphic novels (aka I’ve only read Persepolis prior to this), I wasn’t sure if I would like Fun Home by Alison Bechdel. I brought this book along with me to a weekend getaway at my friend’s earlier this month and it was the perfect beach read. By that, I mean, I was able to finish the novel after devoting a single day to reading it at the beach and it was absolutely lovely! If you’re looking for a book to read for a few hours on a getaway, plane, or train, I definitely recommend taking this along with you. Fun Home is a graphic novel written by the oh-so-talented Alison Bechdel. Before reading her graphic novel, I wasn’t familiar with any of Bechdel’s illustrated works. I knew of Bechdel because of the now legendary “Bechdel Test” though Bechdel has since said she doesn’t actually deserve recognition for the creation of the test (she does deserve recognition for it becoming more known). I knew of the title because of the Broadway musical adaptation’s successful Tony award wins and decided to purchase this book to find out if I wanted to see the musical performed. The novel is autobiographical and details Bechdel’s childhood growing up in rural Pennsylvania and details her exploration of self, sexuality, and gender identity from childhood through her early college years. The novel mainly focuses on her relationship with and interpretation of her father and concludes with her assessment of her father’s death and impact upon her life. While this book is autobiographical, I felt like it spent more time devoted to exploring her father as a character than detailing her own life and, at times, felt more like an exercise for Bechdel to explore how she actually felt about her relationship with her father. I found myself annoyed at the lack of exploration of Bechdel’s mother’s role in her life, who seemed like she often received the short end of the stick, but, as I’m writing this entry, I found out that Bechdel wrote a companion graphic novel entitled Are You My Mother? which I look forward to reading soon. As someone with a complicated relationship with my parents who is seemingly constantly analyzing the impact of my parents upon who I am as a person today, I greatly enjoyed reading Bechdel analyze her father’s impact and her attempts to separate who he was as a person from who he was as a father. While I enjoyed the parental exploration, my favorite parts of the novel involved Bechdel’s exploration of sexual identity and gender exploration, which I think particularly lends itself to being told through illustrations. Bechdel perfectly describes the process of how she came to understand a piece of who she was sexually and that was the highlight of the reading process for me. This book is dark and explores some heavy things that you might not expect from a graphic novel – “fun home” is short for funeral home, after all. If you’re okay with authentic storylines that are brushed with grimness and are at all interested in a young person’s exploration of sexual and gender identity, I recommend reading this book. Do you have any recommendations for other graphic novels that I should try out? I just put a hold on Are You My Mother? from my local library and am interested in exploring other graphic novels if they come with a good recommendation! Publication Date: 8 June 2006 by Houghton Mifflin Company. Format: Paperback. This entry was posted in gender, humor, memoir, nonfiction, Review, sexuality, youth and tagged alison bechdel, autobiography, book blogger, book review, fun home, graphic novel, houghton mifflin company, memoir, nonfiction, review, the bechdel test on August 24, 2015 by Bri with a book blog.